Father’s Day in the MLB is a perfect example of why baseball arguably leads all sports when it comes to custom 1 of 1 footwear. Although custom painted 1 of 1 cleats have made a major impact in the NFL, the MLB has been a bit more open about the whole trend. Up until the end of last season, NFL players were fined for wearing the personalized cleats. In the same fashion, MLB players have been just as actively wearing customs but have caught much less flack from the league when it comes to color requirements and being fined. While 10 times as many games per season may make it harder to keep track of, it more so comes down to letting players be themselves which in the end helps entertain and grow fan bases. 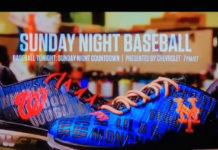 Father’s Day was an obvious win-win for players and Major League Baseball when it comes to customized cleats. Robinson Cano of the Seattle Mariners paid tribute to his father and his stint with the Houston Astros. The cleats feature his father José’s portrait, stats, against the Astro’s throwback stripes. These New Balance cleats were painted by Mache Customs. One of the most frequent to wear customized cleats, Bryce Harper of the Washington Nationals took to the occasion once again in his signature Under Armour cleats. A blue base is covered in Happy Father’s Day greetings and his dad’s name Ron. These Under Armour cleats were custom painted by Kreative Custom Kicks. Houston Astro’s star Jose Altuve took the day to pay tribute to his own kids. These New Balance baseball cleats were also the painting work of Mache Customs. The winner with the most eye-catching cleats is probably these worn by DeLino DeShields of the Texas Rangers. Shields graced the field with a pair of cleats featuring cute images of himself and his father DeLino from his father’s time playing for the Montreal Expos. The toes share the fact that they were the first father-son combo to be drafted in the first round straight out of high school. This set of adidas baseball cleats were the painted handiwork of TheHeyyMan. For Brandon Phillips of the Atlanta Braves his custom cleats brought in good luck as he had game-winning RBIs on Saturday and Sunday. Wearing his cleats, Phillips paid tribute to his pops and what we presume are the names of his kids across the cleats. These light blue Under Armour cleats were painted by SolesBySir.